A General Picture: Sea Lamprey or River Lamprey? It can be confusing here and there when it comes to lampreys. People talk about sea lampreys and freshwater lampreys, and may often simply think they are just different animals with certain similarities. Actually, in a very simple version, adult sea lampreys spawn in freshwater, after a rather long period of larval phase, they enter adult phase. Of the roughly 40 known adult species, only about 9 or 10 pass through a parasitic marine phase and become the sea lampreys; the remaining species spend their entire life in fresh water, either in rivers, lakes, or brooks, and therefore become the freshwater lampreys. Among them only about five are parasitic. So you can also look at the sea lampreys and river lampreys the same. There are about 40 species recorded so far. Please refer to wikipedia's Taxonomy section for details, though the accuracy of the information is currently disputed. I've also put together the info at the bottom of this hub as a quick reference. The most common species are Sea Lamprey, Silver Lamprey, Chestnut Lamprey, and few brook lampreys. Most of them are from the Great Lakes. Parasitic lampreys are predaceous, eel-like fish native to the coastal regions of both sides of the Atlantic Ocean, it has a jawless mouth, sort of like hagfish's. Like the Hagfish, they have only one nostril, which is on the top of the head, and are carnivores. They are believed to have preyed on native species of the Great Lakes since its accidental introduction in the 1800's, and killed many whitefish and lake trout in the Great Lakes. They kill fish by sucking their blood. They are harmful to marine ecosystems and fishers often find damaged or dead fish. Since 1960, people have been trying to control the Lamprey population by sterilizing more males instead of females, and lampricide, a chemical that kills them. 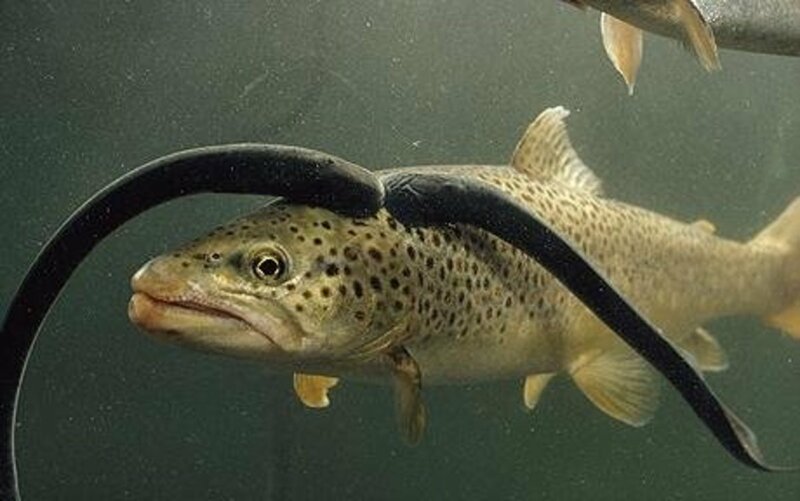 Fortunately, the Lampreys are not completely useless. In some countries such as Alaska, they are served as a dish and taste “just like fish”. Many fishermen find the fish sucking the blood of other fish they catch. In fact, most of their lives Lampreys will be feeding, and when their host dies, they simply move to another one. They don’t mate very often and they don’t lay too many eggs. They swim by flapping its tail and can be over three feet long. The longest recorded must have been around 40 inches, and the smallest 5 inches. They have a single nostril at the top of their heads and breathe through hole-like gills along its front side. Their eyes are small and blue, but don’t really help them much. The only foods of Sea Lamprey are the blood of larger fish. Victims include all kinds of fish, and some species even feed on humans when it is available. 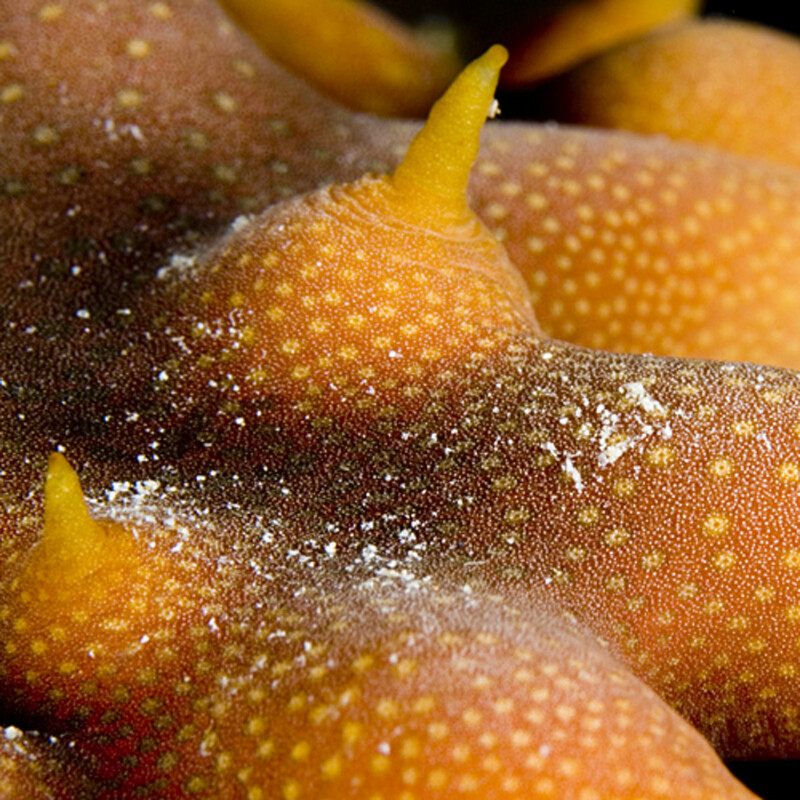 Their mouths are wide and funnel-shaped to stick onto scales, and are lined with large, bony teeth to damage flesh. 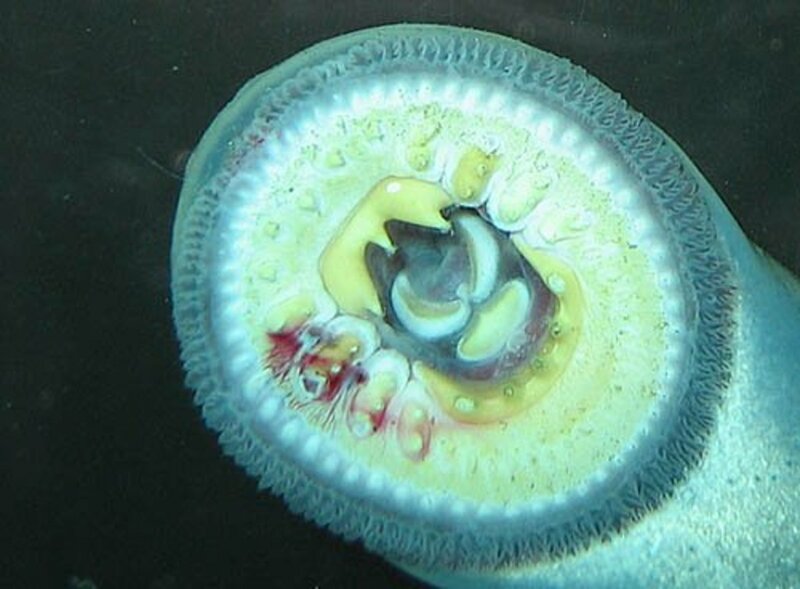 When landing, the Lamprey will start sucking on the victim until their teeth draw blood. The blood is sucked up by the Lamprey. Slowly but surely, the victim will eventually die because of blood loss, or by the wounds the Lamprey inflict. Parasitic Lamprey’s reproduction is very strange. When spawning, large quantities of Lamprey travel to freshwater to mate and lay eggs. The eggs are large and translucent so that the white baby Lamprey can be seen inside. 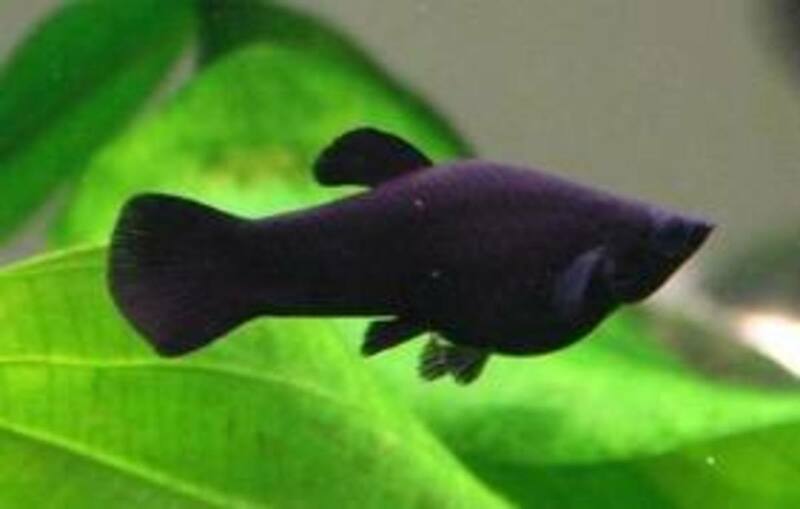 Out of the batch, a small percentage will stay and live in freshwater instead of returning to sea, and another small percentage will never eat. These Lampreys only eat when they are young, and will quickly reproduce and die afterwards from starvation. Their digestive tracts just become non-functional. Scientist are still wondering why this change happens. 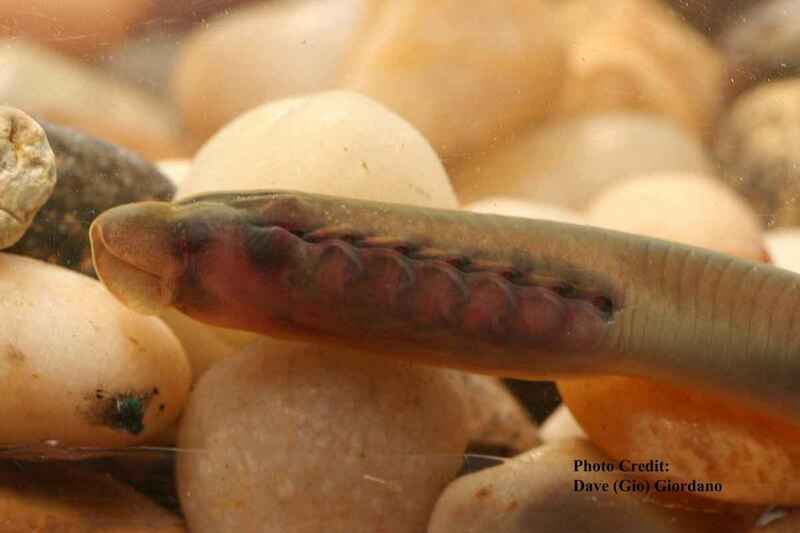 Normal baby Lampreys will burrow into soil when they hatch and mature there. They are called larvae. When they are large enough to leave the burrow, they become mature in the freshwater, and when they are mature they make the trip back into sea and live the process all over again. Chestnut Lamprey - Probably the most common of all parasitic lampreys. Adults are usually olive in color. But they are also one of the smallest, growing from 5-11 feet long. Their bodies are fat and their suction discs are large and firm. They also have the most teeth designed to damage skin and the small openings draw in fluids from the fish. Silver Lamprey - Grows from 4-13 inches, and is slimmer than the Chestnut variety. Another difference is their suction discs, which are less free and almost completely attached to the head. The fins are separate and larger for faster movement. Adult silver lampreys are gray and sometimes silver at the belly. Sea Lamprey - Sea lamprey can grow from a foot to two feet in length. They are similar to the silver lamprey. Their skin is blue or black, and the belly is usually yellow or brown. Surprisingly, their mouths are different from others. They have very big teeth towards the center of the sucker, and none or few small teeth around the outside. 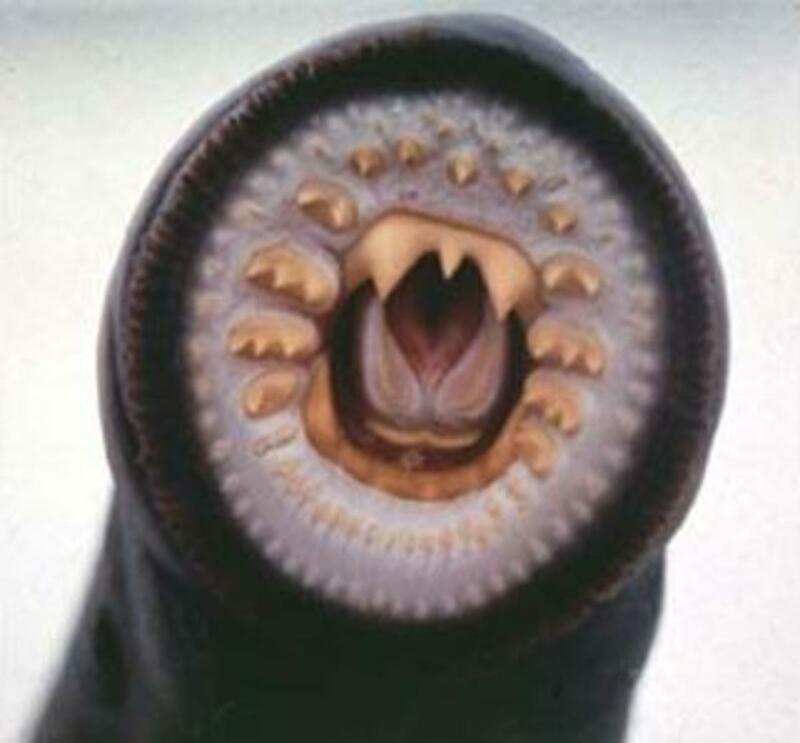 Normally, a parasitic lamprey would have many rows of medium sized teeth that are spread everywhere. 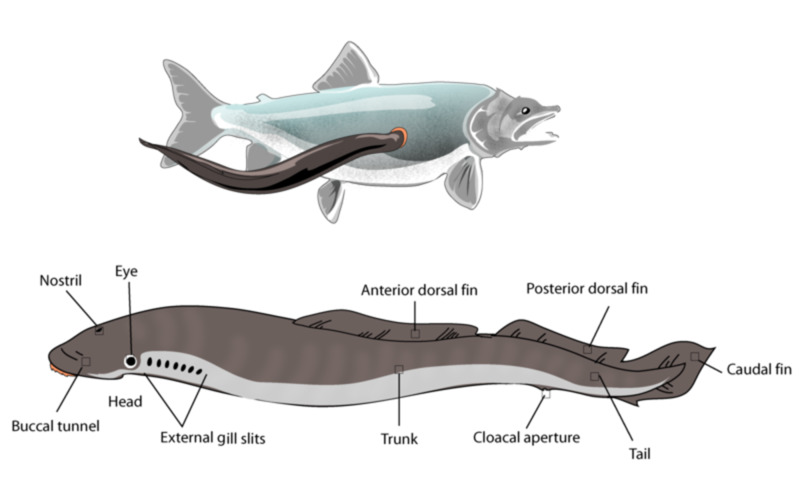 There are three non-parasitic lampreys: Least Brook Lamprey, Northern Brook Lamprey, and the American Brook Lamprey. These strange lampreys only feed during their larvae stage. Unlike parasitic lamprey, non-parasitic lamprey transform from an ammocoete to adulthood in autumn instead of summer. Besides their colors and mouths, there is no noticeable difference between parasitic and non-parasitic lampreys. These Lampreys are more active during the night, where they are less likely to be eaten by predators. Some predators are gulls, Herons, minks, and raccoons. Eggs hatch in nests. The larvae burrow into U-shaped holes in the soil. 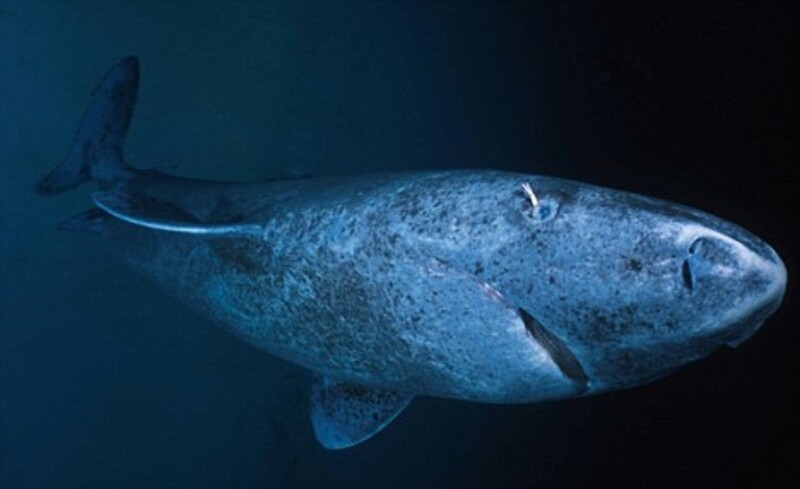 They feed on small food particles, algae, and plankton. 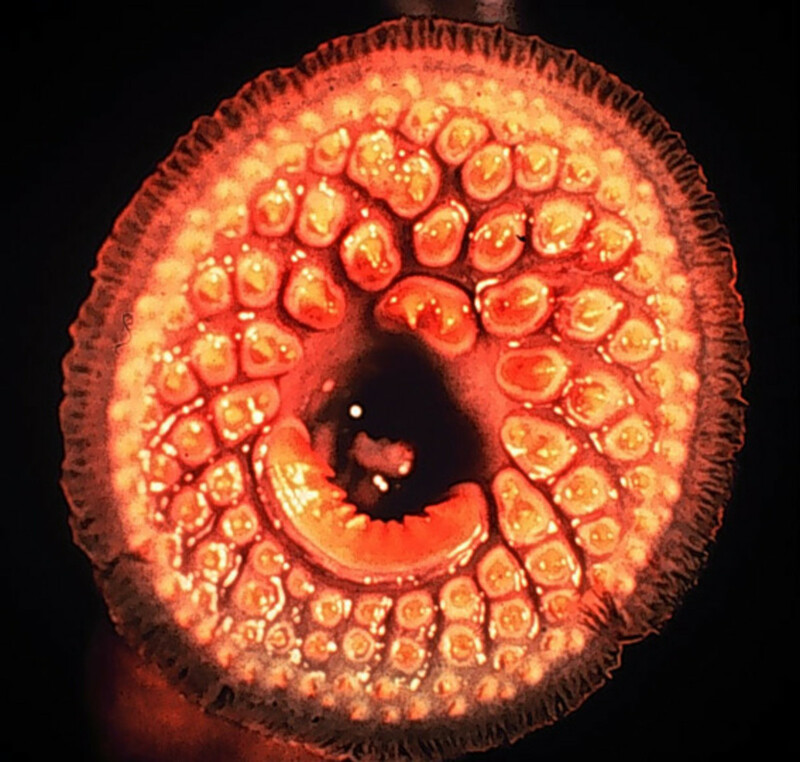 For 3-7 years, the non-parasitic lamprey remains in an ammocoete or larvae stage. Because they turn mature in autumn, they only have time to mate, and die afterwords from starvation. Many do not go out to sea. Like I said before, non-parasitic lampreys do not feed on anything. Even so, one can live for 8-20 months in adulthood. After they become mature, the lamprey’s digestive system stops working. American Brook Lamprey - Very slim, with large triangular fins and a small sucker. The suckers are more free than parasitic types. American Brook Lampreys live in many lakes throughout North America and in many other continents as well. All non-parasitic lampreys are small and this species only grows from 5-7 inches long. Their mouths have 3-4 large blunt teeth around the center, and very few small teeth around. You may also see two large connected teeth on the top of its mouth center. Northern Brook Lamprey - It is even smaller, at 4-6 inches long. They are also found in lakes around the world. 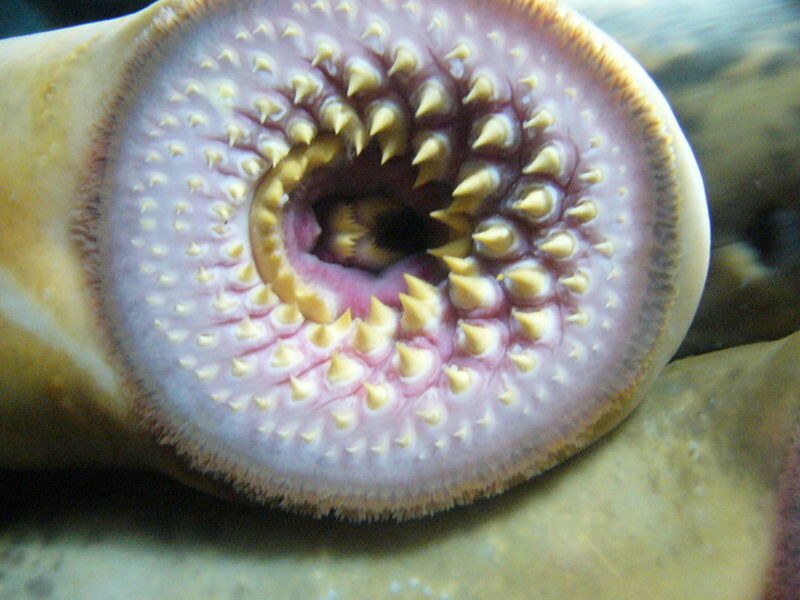 Their mouths are triangular, unlike other lampreys. 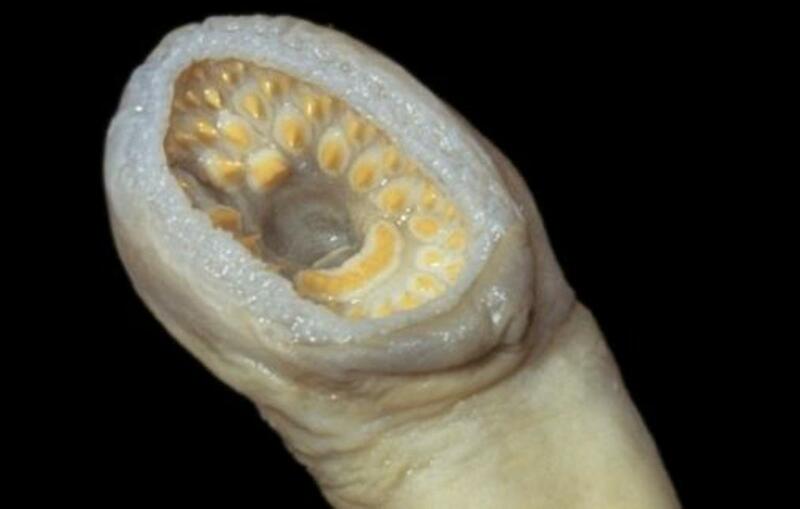 They also have the smallest and most blunt teeth of any lamprey. Their fins are smaller and connected, and its sucker is one of the smallest of all lampreys. Least Brook Lamprey - Scientific name is Lampetra aepyptera, the smallest of the seven lamprey species found in Ohio. The ammocoete (5 mm-20 cm) is clear with a pigmented head when small (<5 cm) but becomes a dark/golden brown as it matures. 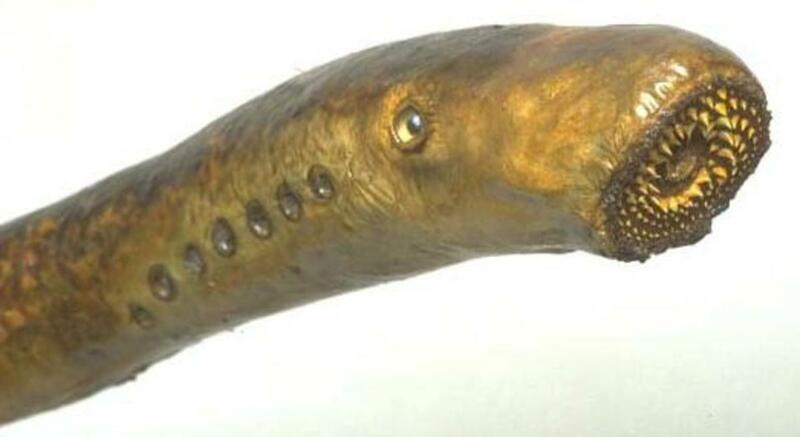 When enters the juvenile stage after metamorphosis, the Least Brook Lamprey becomes golden with yellow tinged fins, teeth and eyes are formed in this stage. It is interesting to know that mouths of various lamprey species are different. First off, the diameter of the sucking disc vary among the species - some are larger than head and others are smaller. The inside of their mouths can also be quite different. Least Brook Lamprey Mouth - Not much information can be found as of this writing. 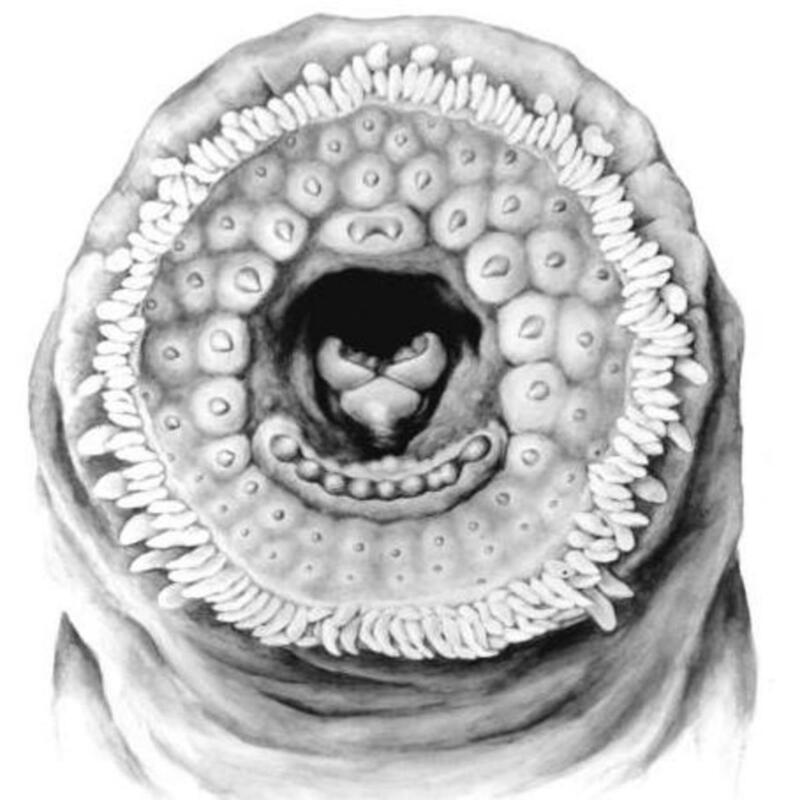 It appears this lamprey mouth has some similarities to that of the Northern Brook Lamprey's, the teeth are small and blunt; the top teeth looks more like that of the American Brook Lamprey's which is widely separated. 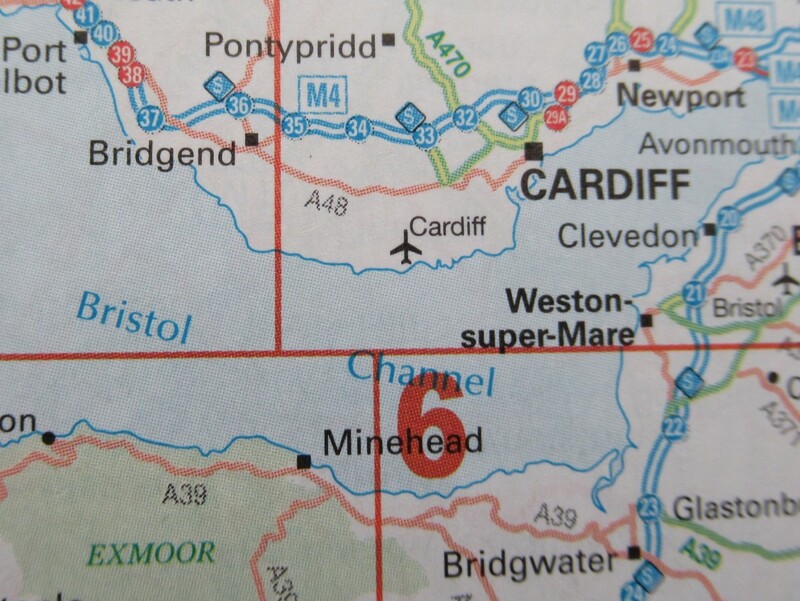 Freshwater / Coarse Fishing or Sea Fishing?